Overpasses For America and Operation American Spring joining forces to save America beginning May 16, in Washington. Five million patriots committed already. Be there if you can! GO, PATRIOTS!!!!…. Overpasses for America, a group founded last year as a vehicle to drive support for Obama’s impeachment, is gearing up for activism across a much wider scope. As last month ended, protesters engaged in a series of events across the nation calling attention to the many scandals surrounding this administration. Another event, dubbed the “Patriots Day Patriot Wave” is set for later this month. Next month, however, a number of other like-minded advocates are joining the movement for a much more substantial demonstration in the nation’s capital. Millions have already expressed a desire to take part in this peaceful call for Obama’s ouster – along with the removal of several federal legislators – during the event. On March 28th and 29th, 2014, Overpasses For America (formerly named Overpasses for Obama’s Impeachment) stepped out to the overpasses and street corners of America for their 11th national protest. Patriot Wave 11, dubbed by the group as Spring Break Out, was the first major event of 2014; and thousands of Overpasses members across America participated in the protests. The group, founded in June 2013, is openly calling for the removal of Mr. Obama from the White House for many reasons, among them his ineligibility for office, crimes committed during his tenure in the White House, and multiple violations of the Constitution. Signs and banners carried during the rallies cite things such as Benghazi, Extortion 17, ObamaCare, the fake birth certificate, voter fraud, and much more. The movement has teamed up with Colonel Harry Riley and Operation American Spring, and members are carrying signs and banners about the Washington DC event that begins on May 16th. Organizers for OAS (Operation American Spring) state that over 5 million people have made commitments to be in Washington for the peaceful demand that Obama and many members of Congress step down from their positions, as well as the return to a Constitution-based government in our nation’s capitol. Neighbors also states that the Overpasses movement is highly encouraging members to find their way to Washington DC for American Spring. He also emphasized that many members of the movement are in dire financial straits due to the failing economy, and those members will be rallying in their area so the nation is aware of the events occurring in Washington DC. Neighbors continued by saying that those who will be in Washington for American Spring expect a media blackout, as is common by the mainstream media when disgruntled Americans protest to express their discontent; and the group believes the protesters across the nation will raise enough questions by the public to media outlets that they will either report the event, or further lose trust of viewers and readers. 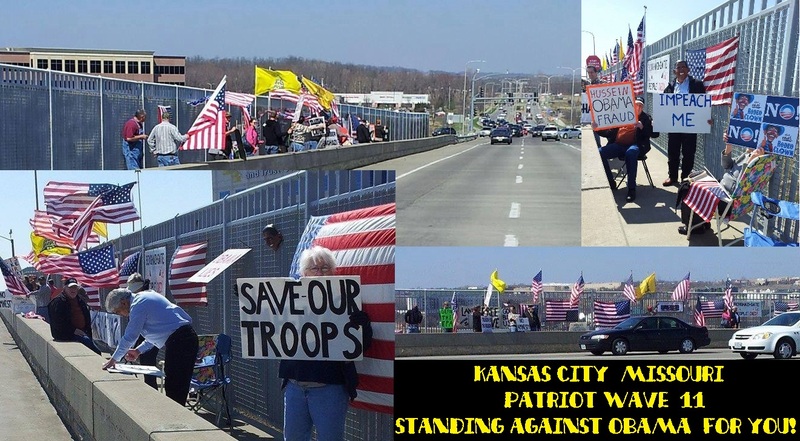 On April 19th, 2014, Overpasses For America will hold their 12th national event, the Patriots Day Patriot Wave, with many more planned for the entire year.